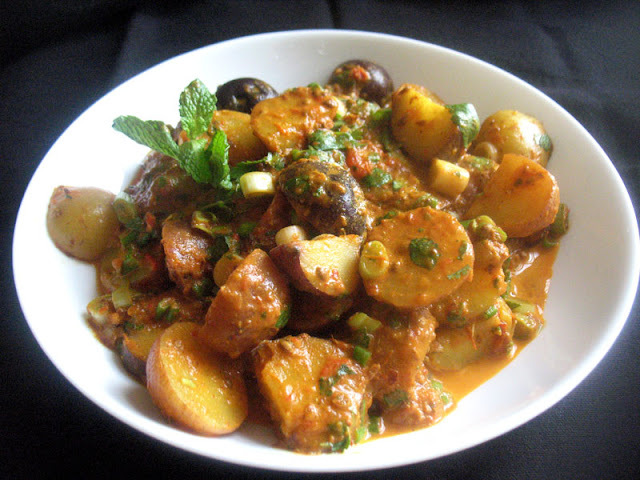 Smoky and hearty, this robust concoction goes especially well with a side grain dish and salad. 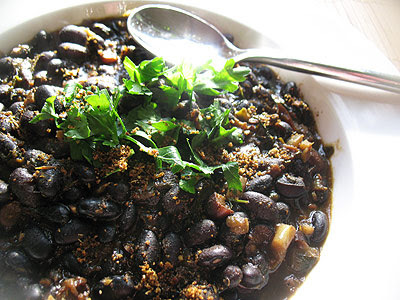 Though black beans are not native to Indian cooking, they sure do go well with Indian spicing. You may also want to consider serving this dish with your favorite Indian flatbread. Easy to prepare if you have all of the staples on hand that are necessary for Indian legume dishes. 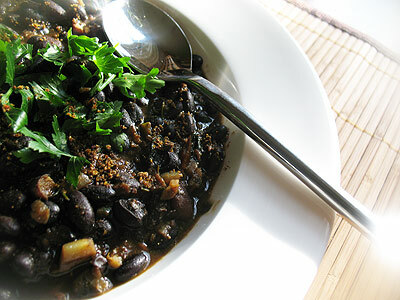 My craving for black beans certainly was met with a reward with this dish. Spicy, nourishing and just tasty and good for you. Rinse the black beans and soak for 8 hours or overnight covered in several inches of water with a little yogurt whey or lemon juice added. Drain and rinse, then transfer to a large saucepan and add the turmeric and water. 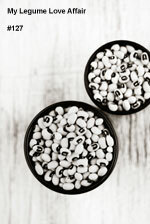 Bring to a boil, reduce heat to low, cover and simmer for 1 hour or until the beans are tender. Heat the ghee or butter and oil over medium heat in a frying pan. When hot, add the mustard seeds and cumin seeds and stir and fry for a minute or until the mustard seeds turn grey and begin to pop. Add the onion to the pan and stir and fry until it begins to brown. Now toss in the garlic, ginger and fresh chilies. Stir and fry for another minute or two. Now add the dried leaves, spices and salt, and stir and fry for another minute. Add the tomatoes and cook, stirring frequently, for 10 minutes or until the tomatoes are reduced and the sauce has thickened. Pour the tomato spice mixture into the pan of beans and simmer over medium-low heat for 15 to 20 minutes or until the beans have thickened. Stir in most of the parsley or cilantro, reserving a little for garnish, and continue to simmer for 5 minutes. Transfer to a serving plate and garnish with the remaining parsley or cilantro and a sprinkle of garam masala. I think you could use kidney beans instead for a good result. just made them. love them. hot! but it works... :0P so glad i just brought back a litre of ghee from bombay. thanks! well done!